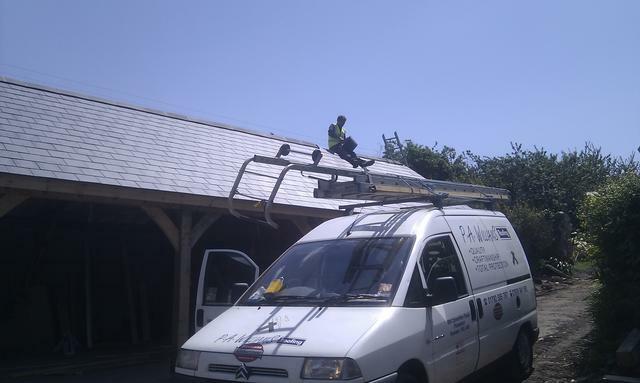 P A Williams & Son are a well established Swansea Roofing company specialising in providing high quality roofing services. We are based in Swansea. This website has been created to give you an idea of the different kinds of roofing work that we undertake and the feedback that we get from our satisfied customers. Please contact us if you would like more information or perhaps a quote for any kind of work done to your roof. We provide a friendly, professional roofing service; from the replacement of a lost tile or slate to complete roof replacement. We provide a flexible, cost effective commercial roofing repair and installation service that fits around your business needs and other trades who may be working for you. We are willing to work directly for the client or be subcontracted to a lead contractor. We provide a wide range of roofing services. Some of these services are listed below. However if you have a particular project in mind that is not listed, then please contact us. If you are not sure what the roofing possibilities are, or how much work is required, please contact us and we will talk through the options, roofing materials and the likely costs. The one part of the your roof that works the hardest is the fascia area around your gutter. We offer a comprehensive inspection, repair and replacement service covering all aspects of guttering and fascia. All our roofing work is carried out to comply with health and safety regulations, and is building-regulations compliant. We can also provide a customised service for larger commercial projects . Although we are based in Swansea and primarily cover the South Wales area, we are happy to discuss contracts in other areas. Please do Contact us, we would be happy to talk through your requirements.